1 The threads of a blanket or a rug may seem like simple craft materials. However, for Native Americans, the threads mean much more. Each thread might symbolize a thought of the artist. Weaving becomes much more than a craft. It is an important tradition for the Navajo culture because it is a vital link to their past. 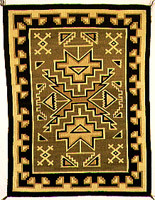 2 According to a Navajo legend, their tradition of weaving comes from a holy person named Spider Woman. She taught them to weave on a loom that was designed by Spider Man. This was not the popular superhero, since the legend is hundreds of years old. The different kinds of poles of the loom were made of sky and earth. The weaving tools came from sun rays, rock crystals, white shells, and lightning. Traditionally, men built the looms, but women did the weaving. 3 Anthropologists believe that the Navajos learned to weave from the Pueblo people by 1650. They were influenced by Spanish settlers who inspired them to weave with wool from fuzzy churro sheep. Before that, the Indians used cotton. The Spanish people also introduced the Indians to indigo dye, which added blue to their rugs. Soon, the Navajo blankets were much more colorful. At first, the Native Americans only wove blankets. Later, they wove rugs to sell to tourists.